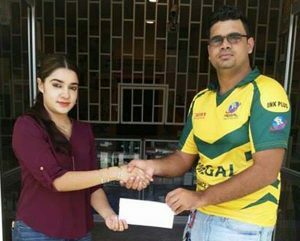 Prem’s Electrical of Alexander Street, Bourda, have supported Regal for the Florida Softball Cup which is set to commence on February 24. Videsh Persaud of Regal All Stars accepts the cheque from Ms. Nirmala. Regal All Stars at a simple ceremony held at the entity’s location, recently. Ms. Nirmala said they are pleased to be associated with the Regal as they look to bring glory to Guyana once again, and wished the teams well. Persaud thanked the entity for the support. Regal Masters and All Stars are among several Guyanese teams slated to take part in the tournament which will conclude on February 26 at Central Broward Regional Park and Stadium, Lauderhill, Florida. The event, which is being hosted by the Honourary Consul of Guyana in association with the South Florida Softball Cricket League, forms part of the Guyana Republic Day celebrations in Florida. Regal last outing saw their Masters and All Stars teams winning the New York Legends and Independence Cup in 2016.